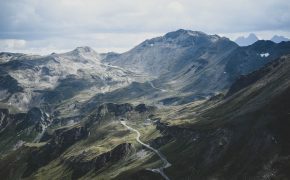 If you’re considering vanlife and you have a dog – or if you already live in a van and are thinking about adding a canine companion to your life – you’re probably wondering how in the heck you’re going to make it work with your furry friend on the road. 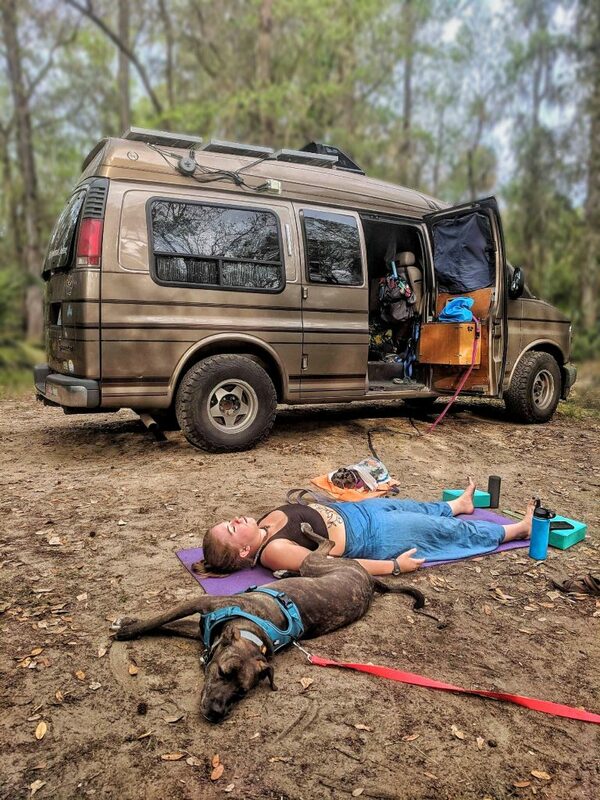 Vanlife with dogs is not only possible, it can be very enriching to your experience. And we should know – we have three (yes, three!) 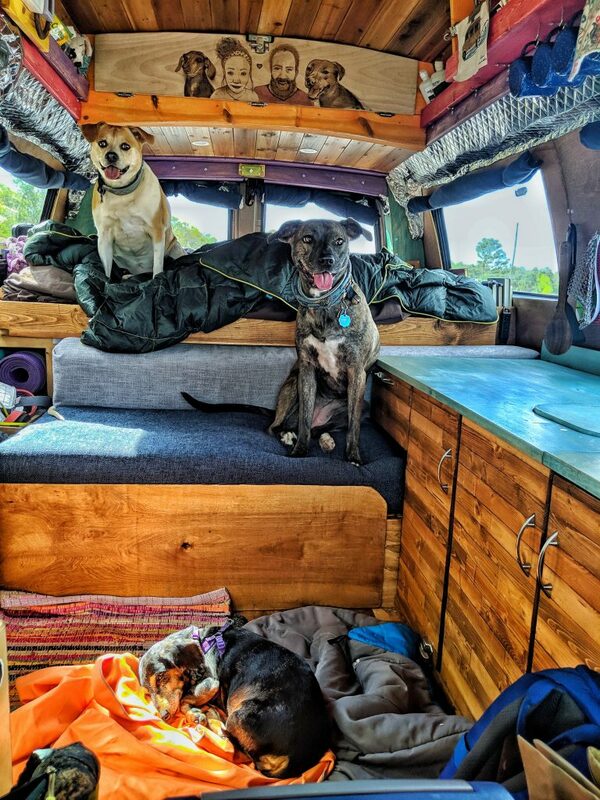 dogs in our hand-built ‘96 Chevy Express. We’ve also been on the road full-time for over a year. When we first hit the road in April 2017, we had two dogs – Nymeria, a 3-year-old terrier mix, and Crow, a 17-year-old miniature dachshund. (That’s not a typo- we joke that she’s the ‘Keith Richards’ of dogs.) 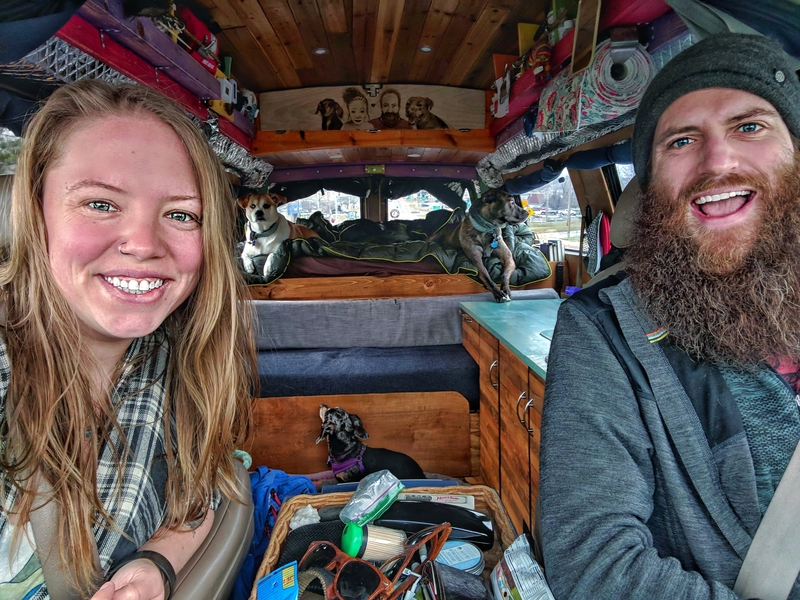 We were fairly confident that vanlife would be a breeze with these two because of their adaptability to life, their adventurous charm, their loyalty and their responsiveness to training. 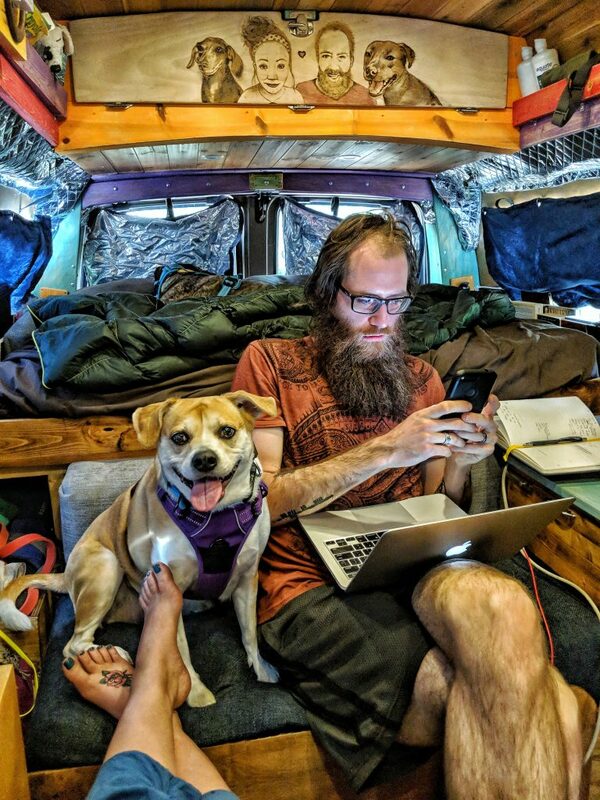 Crow, because of how old she is, is a pretty easy dog for vanlife. She basically just sleeps, goes to the bathroom, eats, and repeats. Nymeria, on the other hand, is much more adventurous, but she’s also very intelligent and motivated to be obedient to impress us. We’ve just recently taken in Delilah, a 7-year-old mix, but she’s adapting beautifully to life on the road. 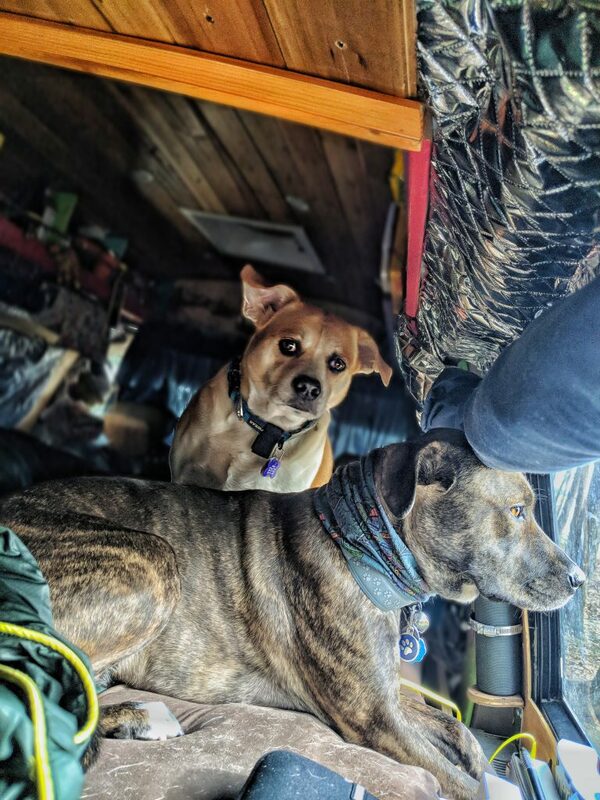 Before we even bought our van, we knew that there were some key commands and habits that our dogs needed to be comfortable with before hitting the road. All of the basics like sit, stay, and come are vital, of course. But there are some other behaviors that we have found very helpful on the road. We’ve trained our dogs to never exit or enter anywhere without our permission. So anytime we open the doors to the van, the dogs sit, stay, and wait to make their move until we give them the command. This helps tremendously when we find ourselves in busier areas such as gas stations or supermarket parking lots. We also knew it was important to build trust with our dogs off-leash. What worked for us? Taking them to dog parks and off-leash areas, and rewarding them heavily whenever they came back to us. This helps them come when called and encourages them to stay nearby when they’re off leash in the wilderness. When we took Delilah in, we taught her these habits as well, and she caught on very quickly. One of the most common questions people ask us is if we leave our dogs in the van unattended. And the simplest answer is – no, we don’t. Everyone’s relationship with their dog varies, we know, but for us, they really are like our own children. We would never leave our kids in a vehicle to go out to a restaurant just the two of us. We would either put them up with a sitter or find a restaurant where they can join us. And that’s exactly what we do with our pups. If we want to go out to eat, we find a dog friendly patio in the area. If we need to shop for groceries, one of us stays back in the van with the dogs. Sometimes we want to check out a town, which may include going into different shops and other things that aren’t necessarily dog friendly. You can drop your dogs off for a few hours, or you can leave them for several nights. You can also filter your dog sitters by certain criteria, such as fenced in yards or whether they have children. There’s something for everyone, and it’s fairly affordable – usually around $20 – $35 per dog, per night. We included the dogs’ needs when planning our build, as well. On the back of the passenger seat we have an organizer that holds dog stuff that we need daily, like spare poopy bags, treats, etc. – the small, on-the-go stuff the girls need. There’s a storage box we mounted on one of our doors that holds all the rest of their items, like their food and food bowls, leashes, harnesses, meds, and toys. Of course, we also thought about them when building our bed. We knew there would be a lot of living creatures sleeping in the van, so we opted for a convertible pull-out queen-size bed. During the day, it consists of a couch and a rear bed platform that the dogs love laying on to look out the windows. But at night, we pull out the frame and rearrange the cushions into a queen-sized bed. This allows all five of us to stretch out and get a good night’s sleep. There are so many little tips and hacks that help things run smoother on the road. We have a towel just for the dogs. That way if the dogs find themselves in a very messy situation, we’re not using one of our everyday towels to clean them. We also have collar lights for all our dogs, which helps us keep tabs on them when they’re running around at night. A happy dog (and a well-behaved dog) is a tired dog, and it’s always important to keep your dog well-exercised. We make a point of going on two walks every day no matter where we are, and seeking out opportunities for them to play with other dogs and run around off-leash. All of this exercise keeps them tired and happy, and makes it much easier to manage everyone. One of the challenging parts of vanlife is dealing with very hot days. It seems as if no one has found the perfect solution yet to combat the heat, but little tricks can go a long way. We have cooling towels for each of our dogs, and these help tremendously. These are small towels that you get wet and drape over the dog (or yourself), and they use evaporative cooling to wick away heat. The dogs seem to appreciate it a lot. Living on the road with dogs can be a lot of work, but it’s worth it if traveling with your pups is important to you. We’re frequently reorganizing and reshuffling things around – but we’d be doing that no matter how many dogs we have. Including our dogs in this chapter of our lives has been the most rewarding thing we’ve done. Our dogs’ colors can truly shine the way they were meant to, and they can fully be themselves. Crow is quite the sleeper, so she enjoys resting under the shade of a tree or next to a cool, calm river. Or curling up in our laps when we lay in our hammock. Delilah, our newest addition, is the curious one. She’d spent most of her life in a house and backyard and never ventured further than next door. Now she gets so much excitement from all the different scents and scenes surrounding her every day, and she just can’t get enough of the new environments we’ve been introducing her to. And Nymeria is our little warrior princess – the ultimate adventure pup. She jumps up trees, down mountainsides, splashes in water, chases all of her wild friends, sprints as fast as she can, and she’s smiling the whole time. We always joke that we built the van for her. She used to lay on the windowsill in our old house, staring out the window, and we knew we had to show her where she’s supposed to be. Now she is able to be there every single day. There’s nothing quite as rewarding as living the fulfilling, flexible lifestyle that vanlife offers you. It makes it so much sweeter when you get to enjoy it with some four-legged companions! What about you? Do you travel with a pet(s)? Are there any tips or travel hacks you find useful for vanlife with dogs or cats? Let us know in the comments below! 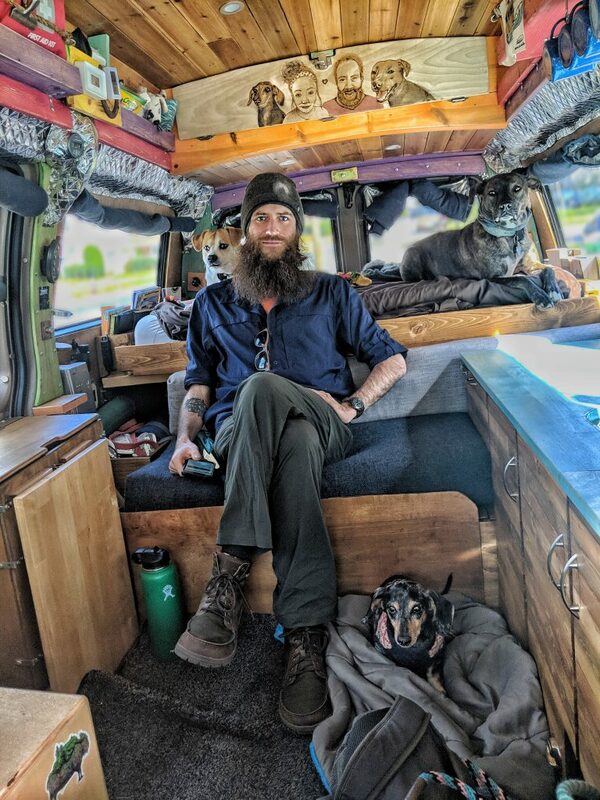 Jayme and John of Gnomad Home are the ring leaders of their traveling zoo of 3 dogs, Nymeria, Delilah and Crow. When they’re not navigating to the nearest swimming hole, or hiking through the middle of the woods, you can find them either exercising on their own… Or taking a run with one of the dogs among the trees surrounding them, or hopping on the yoga mat for a much needed flow. You’ll probably find them parked next to a fire, with instruments in hand, singing the sun to sleep. We also travel with our dog, a Golden Retriever and we cannot see it in another way. Arthur, we can’t imagine our lives without Ziggy so we completely understand. 🙂 What’s your retriever’s name? How did you find them (or, like in our case, how did they find you)? Thanks for the wishes and safe journey to all of you, too. 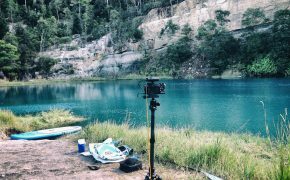 I’m a van life lover and I like your tips about this lifestyle…I just love van life. 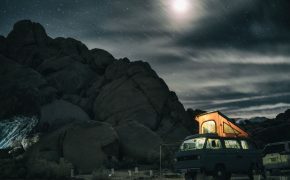 I spend 10 years of my life in my campervan, but last year I went back to my home after a long time. But I want to go back to my van as soon as possible. Someone theft my van a few months ago when I was in my friend home…. I really miss my van a lot….